LET’S TALK ABOUT THE TECHNOLOGY LIFECYCLE. Whilst the concept of a Managed Services Finance offering constitutes images of a new technology solution supported by a new contract, the commercial reality is a customer is committed to either using old equipment or an existing finance payment. The challenge then for any organisation selling technology, is how do you remove the old solution and unhinge the customer from their existing financial obligation and / or level of comfort with their old equipment? Generally, from a financing perspective, incorporating a termination payout of an existing contract can be factored into the cost of a new solution. Instances where old equipment is owned by the client, investigating the use of companies whom specialise in technology deinstallation, recycling, approved data destruction and hardware refurbishing is another path to offsetting upgrade costs for a customer. Buyback and data destruction services of this nature are offered by companies in this space on new equipment, allowing the end customer to have the disposal costs paid as a monthly service over the term of the agreement, for cashflow benefits. 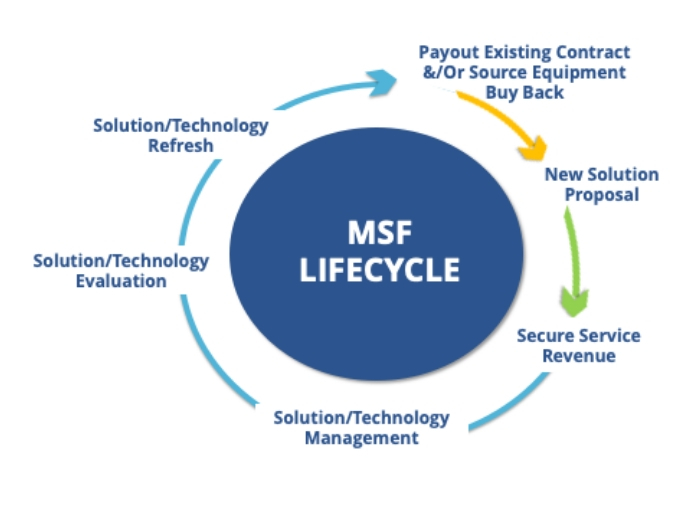 In turn providing recurring income for the Managed Services provider. How many customers do you have that are scrambling with inadequate technology, whom could benefit from a solution upgrade, aided by a managed services finance facility? Here’s where we can help. Give your SER Account Manager a call now.